Pullbox Review: Psycho Gran #1 – Raw Fun! Publisher Blurb – First published in the cult British kid’s comic Oink! 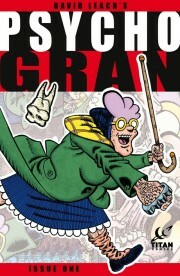 back in 1986, Psycho Gran is the psychotically demented brain-child of cartoonist and comic book editor, David Leach – winner of Channel Four’s Come Dine With Me, editor and writer of the Wallace and Gromit newspaper strip and the Adventure Time comic magazine and editor of Roman Dirge’s Lenore. David is also the co-creator of cult 1990’s strip The Driver for British comic Toxic! Psycho Gran (or Psycho Besta as she’s known in Norway) is a five-foot high, mauve-haired, bespectacled, psychotic granny with a pan-dimensional, sentient handbag called Percy, a flying dog called Archie and a pathological loathing of rudeness. Join her for an all-new, 29-page, full-color journey into a surrealist slapstick world of rampaging kaiju, neo-Nazi skinheads, bag-snatchers, death-row inmates, explosive diarrhea and those annoying SOBs who will insist on using their bloody cellphones in cinemas. She puts the Old into Old Skool Kicking! Issue one opens up with the overly-excited old Gran yelling “159” over and over again on a boardwalk. A stranger stops her to ask her why she is yelling, she thrashes him to the ground and starts yelling “160”. Yea… and the issue just gets funnier! For most American readers, this might be their first exposure to Psycho Gran, but anyone who has loved Mad or Cracked will crush all over Gran and her unceremonious heroics. Psycho Gran fits on the pseudo-adolescent shelf in my geek heart right between Spy Vs. Spy and The Three Stooges – ruckus-like physical humor with a quirky protagonist that tells a fun short story. This comic series is made up of small surrealistic vignettes that revolve around (for the most part) Gran protecting the common good by derailing, shutting down and sometimes even consuming the poor saps that annoy her. Twisted tales filled with raw slapstick humor and eye-popping art that makes you giggle out loud – doesn’t get better at the end of a long day!